There is an old adage that says something like "the difference between rich people and poor people is that the rich have more money". This is true, but not very insightful. I'd like to suggest that often drivers think along similar lines and say "the difference between pro drivers and amateur drivers is that pros are faster". You might substitute "talented" for "faster" but the idea is similar. And, again, while this may be true, it isn't a very useful observation. I'd like to propose something more useful. We work with many drivers, and we enjoy the challenge of figuring out a driver's needs and working to address them. We end up working with younger drivers because we have programs (e.g. SM, Spec MX-5 Challenge, Global MX-5 Cup, TCA, TC and TCR) that form the bridge from karting to Pirelli World Challenge or IMSA. Many drivers face a challenge that is epitomized in younger talent. Basically, young drivers often show up having worked for years to be able to do fast laps. Not everyone is equally skilled in this department, of course, but lap times are thought to be the sine qua non of driving. And you can understand why pace is a powerful part of a driver's psychology when you realize it is almost always a) what they had to work hard at and b) it is what eventually separated them from other drivers. It is natural to focus on the talent than got you to the next step. The problem with this focus on pace is twofold. First of all, most drivers who are fast and moving on to MX-5 Cup or another semi-pro series are suddenly pretty average. Sort of like the high school valedictorian who gets into Stanford and suddenly finds that she suddenly isn't the smartest person in the room any more. The upshot of this is that drivers have to continue working on pace and every 0.1 second at this level is pretty hard won. One important difference between pros and drivers who are stuck in the amateur ranks is that the pros have a mentality that helps them keep progressing and drivers who are stuck do not. Stuck drivers focus on being acknowledged and rewarded for the skill they have; drivers headed toward pro status focus on learning. The second issue with the focus on pace is that it is fairly blind to the study of race craft. There is, quite simply, a big difference between drivers in their approach to a race, when to push and when to cruise, when and how to pass, how much to learn about car setup, how to find and learn alternative lines, how much risk to take and even what finishing position to try for. Pros are often lifetime students of this part of racing; stuck drivers don't put in the effort to build race craft skill. In summary, the difference between pros and stuck drivers is the rung of the ladder they are on. Now, it isn't easy in reality to move up to the learning rung. 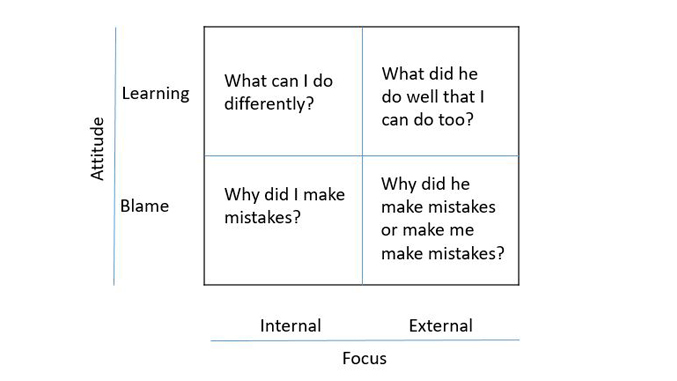 But, if you can catch yourself blaming, you can start to switch to the learning questions and eventually those questions become habit. Of course, pros have other advantages like seat time and bigger teams. Those may be outside your financial capacity. But switching rungs on the ladder isn't.